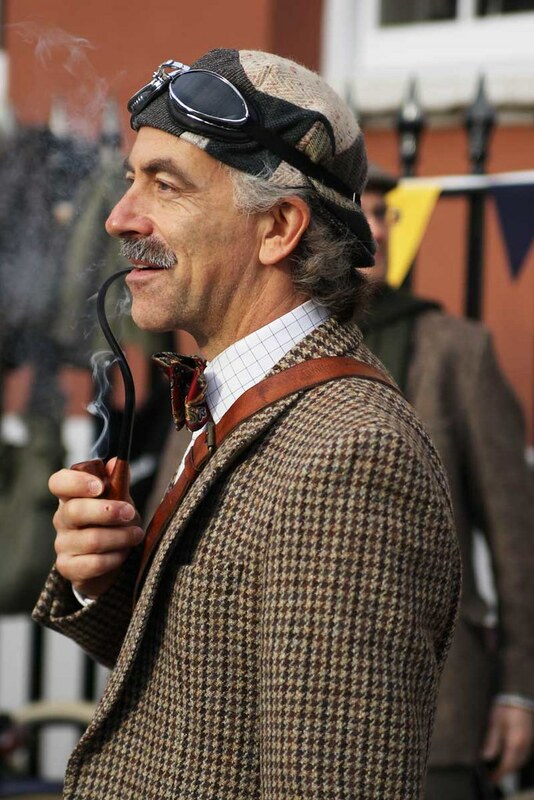 This weekend I joined an army of tweed clad enthusiasts for a cycle through London for the latest instalment of the Tweed Run. 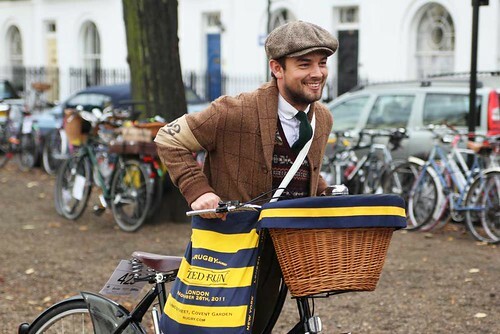 For those of you unfamiliar with this undeniably British celebration, the Tweed Run is a metropolitan cycle with more than a dash of style, fun and dress up. 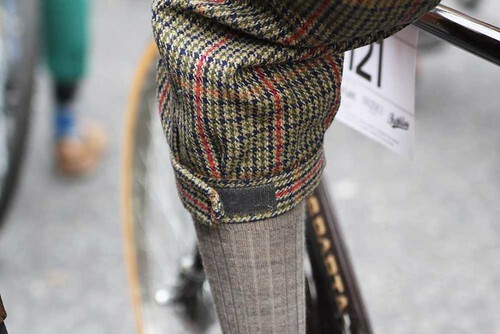 Each year, it serves up a leisurely jaunt that explores the capital all in the name of promoting cycling, gentility and the love of all things tweed. 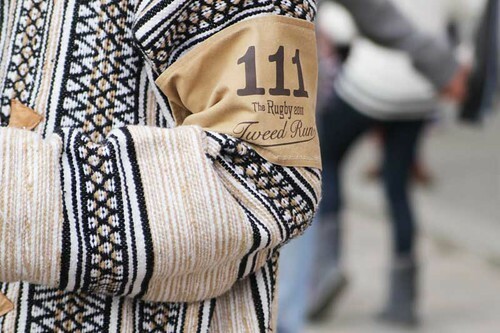 This third instalment was a special edition that celebrated the opening of the first Rugby Ralph Lauren store in Europe and took place on Saturday. 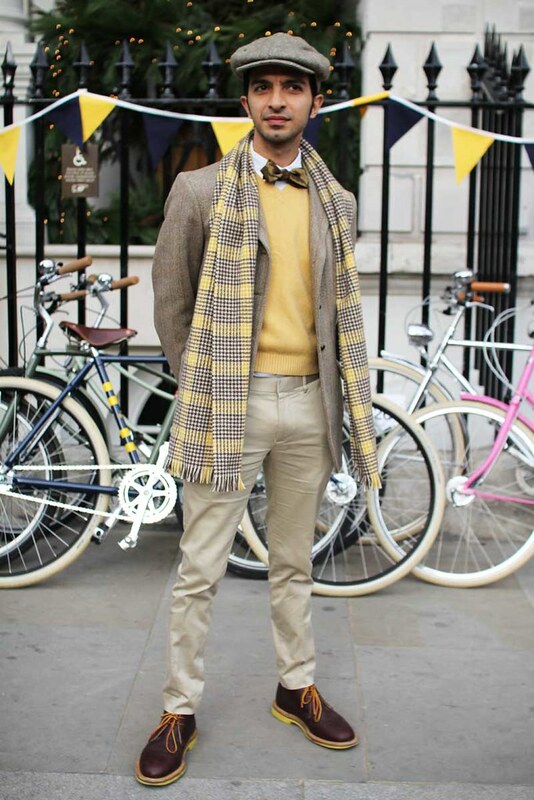 The extravaganza kicked off from the new Covent Garden store before hundreds of tweed cloaked cyclists embarked on a twelve mile spin through London's streets. The route saw us explore some of the city's finest landmarks, and included a short stop off for that quintessentially British treat, a tea stop. Throughout our route, traffic and passers by alike grounded to a halt to wave us on and were greeted with a chorus of Tally ho, good morning, thankyou's and much cap doffing. It was a surreal experience all round but bloody good fun. My body might still be aching, moaning and groaning but it was well worth it. 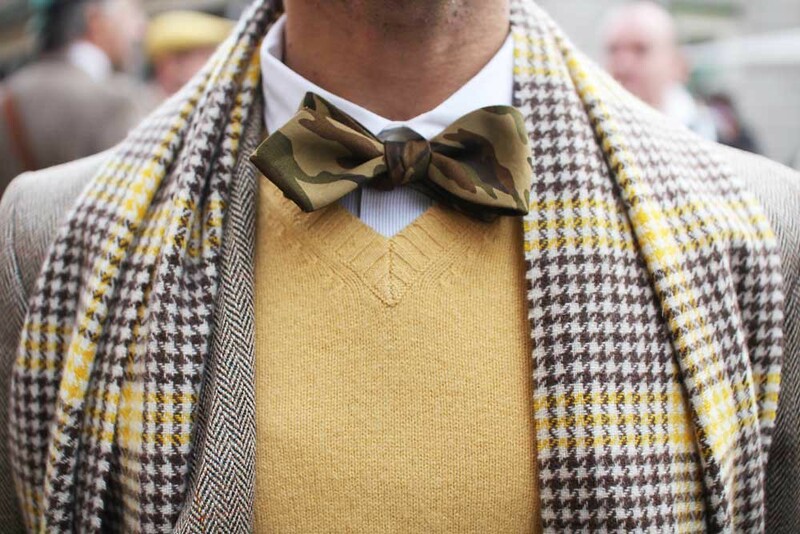 For such a burly and utilitarian fabric, tweed is all of its glorious forms often evokes a great deal of romantically nostalgic feelings. So, it should come as little surprise that some of the outfits on show had a dash of retro about them. 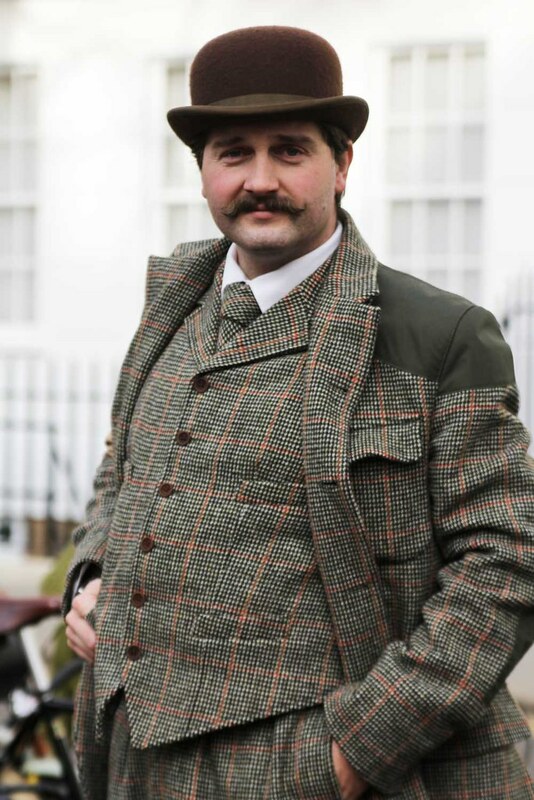 However, that was not the whole story as so many put their own spin on tweed. What truly excites me about this cloth is how its hues are redolent of the landscape of these Isles. Each wonderfully individual piece echoes the sea, the grass and the rugged life of where it was spun. From Berwick to the Outer Hebrides of Scotland to Ireland and beyond, this special cloth is woven throughout the British Isles. Thankfully, the outfits on show were a true celebration of this truly special, yet sadly all to often neglected cloth. 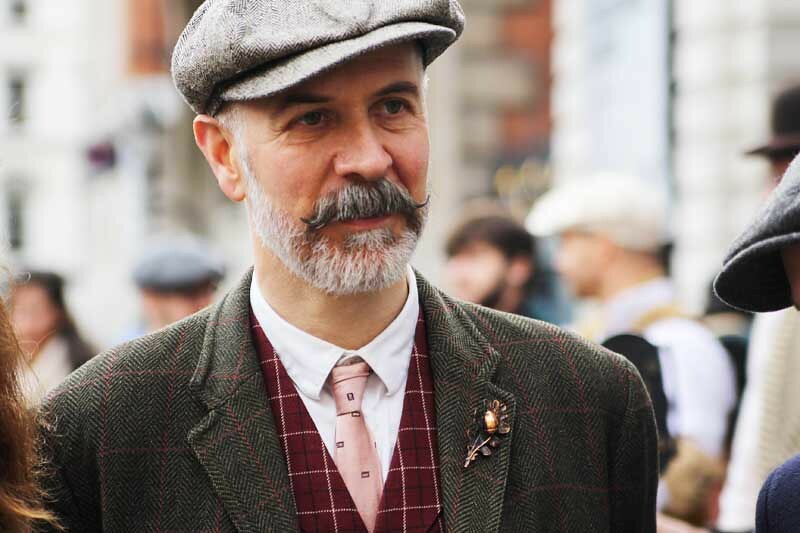 I'm tempted to describe the Tweed Run as Pitti Uomo on two wheels because there is undoubtedly a peacock element to proceedings as people preen and strut in Prince of Wales check, herringbone and houndstooth with consummate ease and grace. 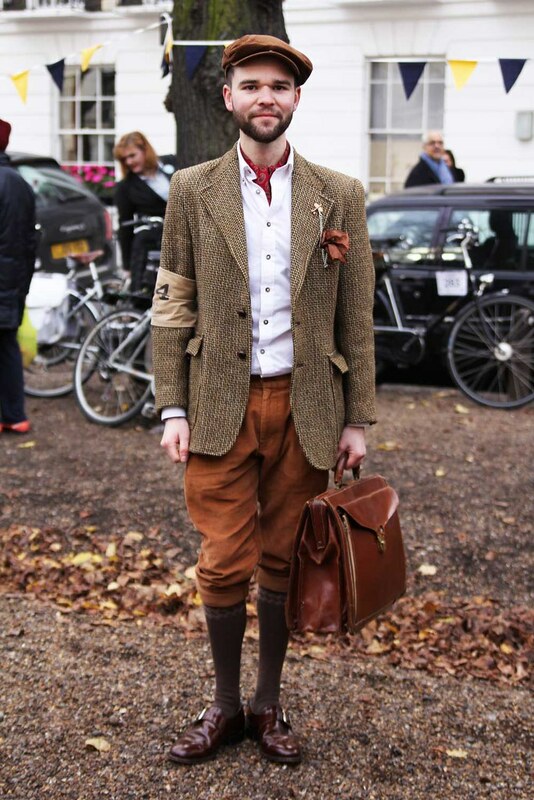 When I was not navigating the streets of London on my borrowed Pashley, I was taking photos of the sartorial spread on offer. Before we set off on the bum numbing journey, I took a number of portrait shots that will shortly appear on Rugby's blog but as I was captivated by the sights on show, I ended up shooting an SD card full of shots for my own personal use. 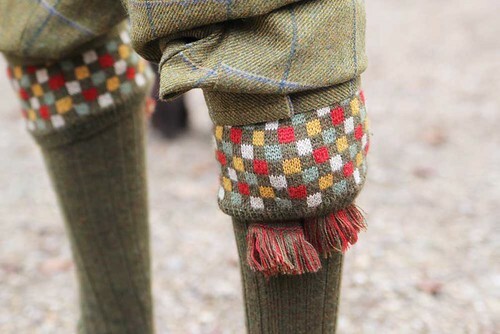 Below is just a small selection of the details that caught my eye...a festival of tweed. 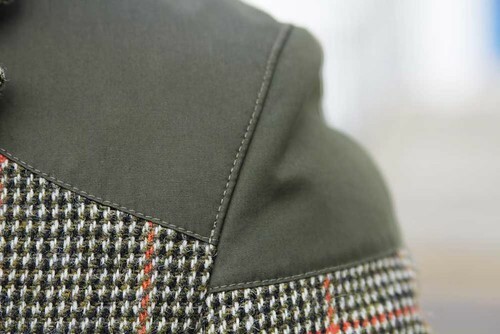 Had to end this roundup with a close up of the Mallory jacket from Nigel Cabourn. 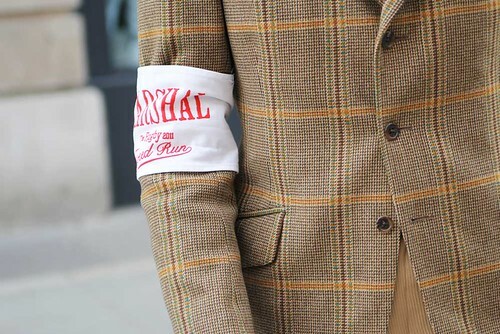 Ultimately, the Tweed Run is a bit of fun. It reminds us to that dressing each morning should not be a chore or a bore. We might not take it to this extreme everyday but we should all have a little fun each morning while putting in a little extra thought in to each outfit. It’s surprisingly fun to spend a little bit of time in the morning putting your clothes on. As a self confessed factory fetishist, I like nothing more than traveling the length and breadth of these Isles and beyond to get my next fix. However, it just isn't possible to practice craft voyeurism as much as I'd like to. Thankfully, S.E.H. 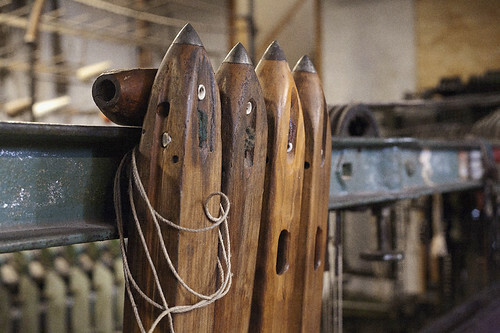 Kelly's captivating website offers a welcome glimpse in to their network of makers. 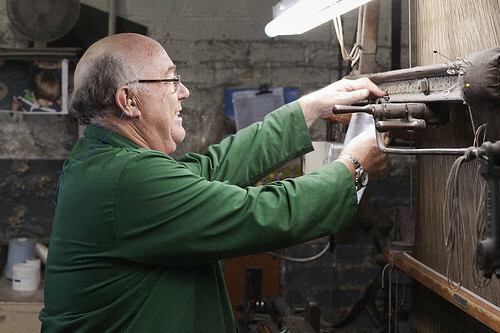 Every aspect of every garment is made with the domestic clothing industry, with steadfast adherence to quality and the sturdiness of British make and makers celebrates them. 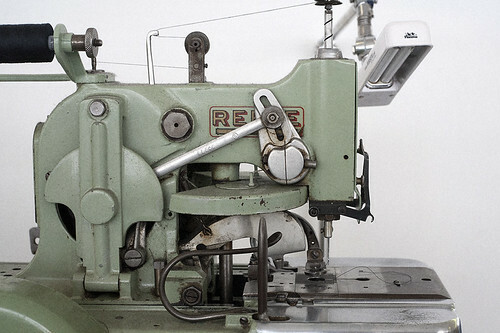 Now, there are far, far simpler, quicker and cheaper ways to get garments made. S.E.H. 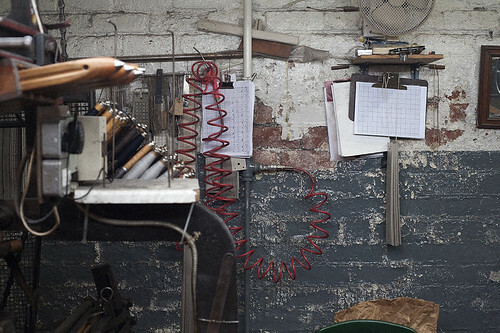 Kelly use these suppliers and craftsmen because they know them, trust them, like them - as individuals and as establishments - and even more importantly for the finished garments, like the qualities and the idiosyncrasies of British cloth and a British make. 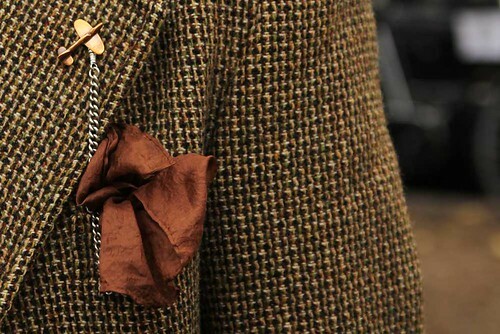 It tends to be sturdier and heavier, and those qualities go on to inform their covetable garments. "There used to be dozens of mills where this mill stands in West Yorkshire. Now there’s just a few, and most of them have banded together under the same ownership. What’s fascinating here is how many different generations the building and the contraptions within it span. 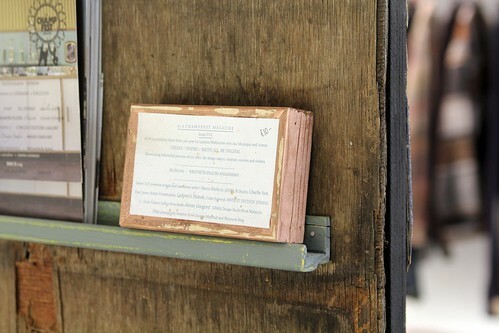 The pictures here are from the oldest part of the mill. The processes and exactitudes haven’t changed a jot for half a century — and in many cases, much longer than that. Every time we go up, we invariably come back with something new. Last time it was a terrific flecked mohair. 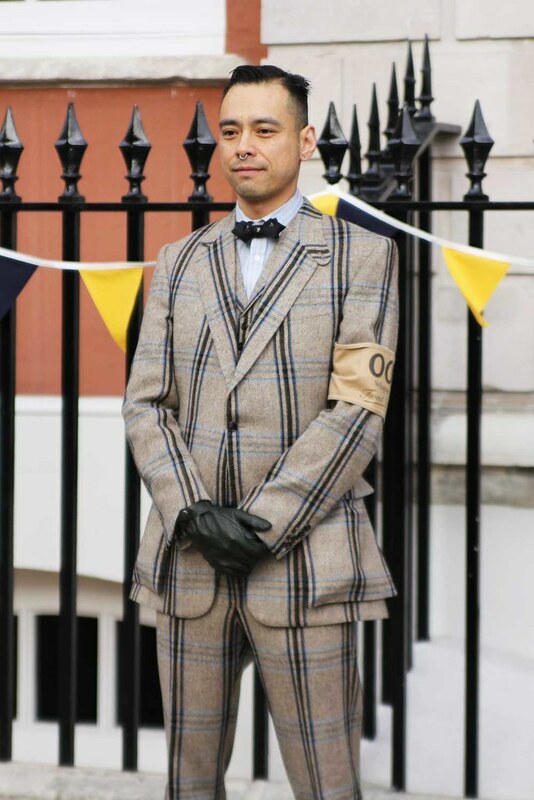 We also recently used a marvellous thick chalkstripe suiting from here which we used it for some overskirts." 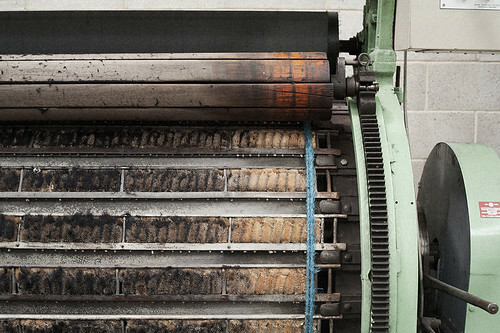 "This factory in North London is one of a few we work with. 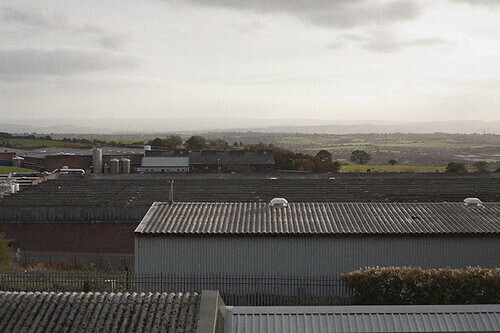 They’re a close-knit bunch, these factories. Everyone knows each other, and has worked with one another at some point or other. These guys specialise in outerwear, and when we started out with them, make quality immediately went up a notch. 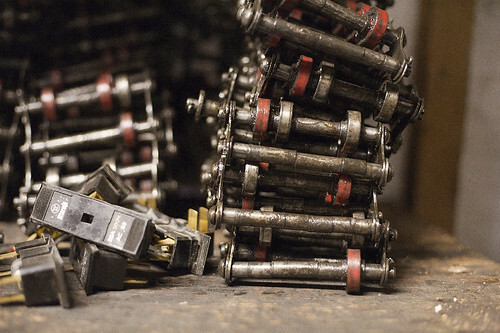 You get a feel for a factory the first time you visit. There’s a good atmosphere here, workers’ kids can often be found running about the place, and tea-breaks are regular and bountiful. It’s a real familial vibe, which is reassuring. 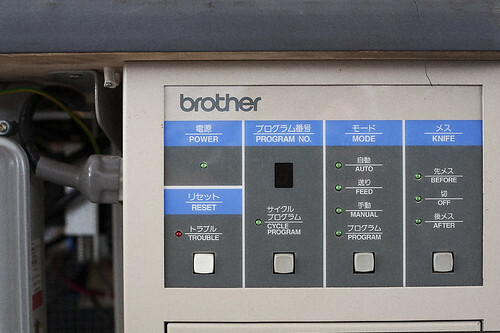 One of photo here is their button-hole machine. 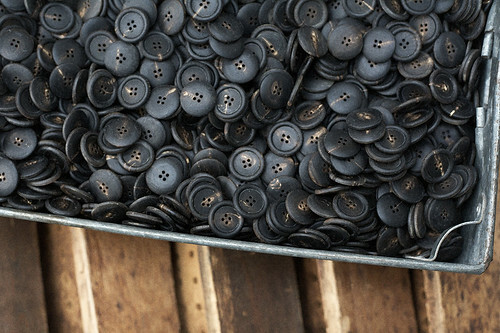 Worth its weight in gold, the well-maintained button-hole machine." 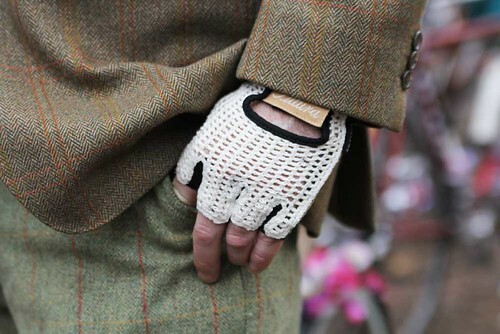 "This is a woollen and tweed supplier based in the Cotswolds. 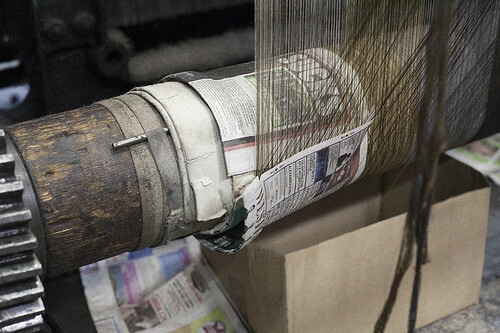 Last time we went we encountered a bunch of interesting stuff, like a super-heavy tweed that was once used to line the interiors of high-end automobiles, and a new range of all-natural and un-dyed wools, of which there has apparently been a surge in demand of late. 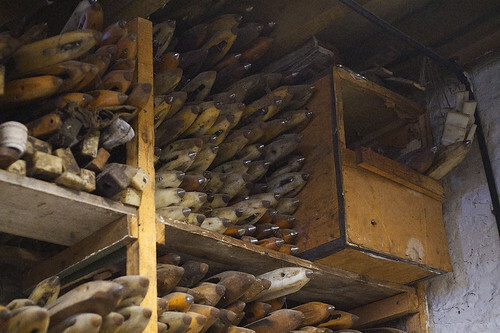 Here you can see the wooden shuttle looms they’ve used over the ages, and some other archaic-looking contraptions and parts. Really should ask what they’re for." "Not all buttons are created equal. At least, that’s what we tell ourselves. We’ve been working with the same button maker since we began. 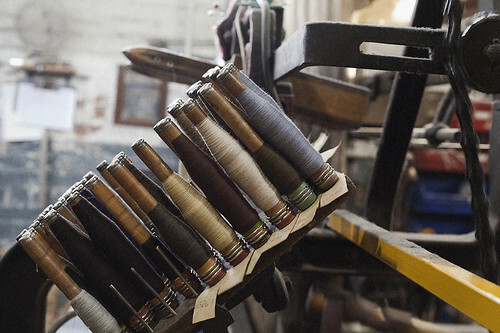 In fact, since before we began — they’re a place we first encountered during our time on Savile Row. Not only do we work with the same place every time, we mostly get the same buttons: matte horn ones with a satisfying little dimple in the middle. Of all the makers, this is the noisiest — the din of all those buttons rattling around the place rings in your ears for hours after you’ve left." 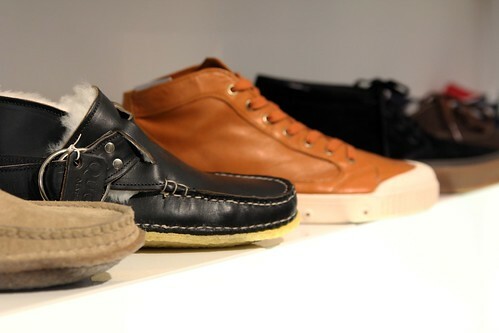 "This place supplies the great and the good of the international fashion industry. And us. We’ve worked with them for a while, and they know what we like. If we had our way, we’d order meters by the dozen, but as it stands, because their stuff is at the top end of the market, and the prices match, we have to be selective. 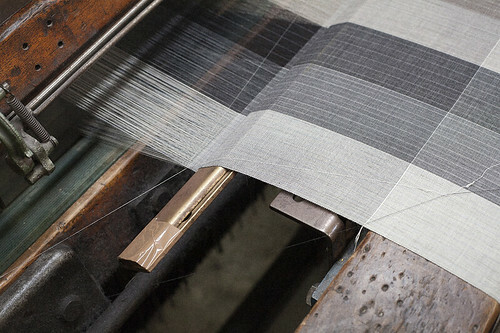 Our most recent acquisition was a charcoal wool-cashmere “birdseye”. Stupefyingly lovely stuff. 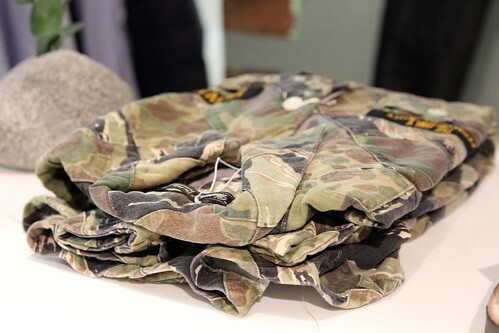 And we’ve got some very lightweight wools lined up for spring. Wool mightn’t be the first thing you’d associate with spring, but the stuff’s so good — and our spring-time cloth options are limited compared to winter — that it’s all but impossible to pass up. 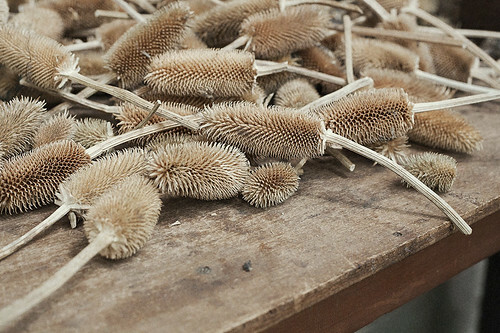 The shots here are of the teasel-gig: a curious machine over which cloth is rolled to soften it up." After months of planning, mood boards, factory visits and samples, the fruits of the sixbysixbloggers project officially launch today. Now, if you've somehow missed my previous posts on the project (here and here), sixbysixbloggers is an exclusive creative collaboration driven by global online marketplace Farfetch that showcases the production skills of cool shoe powerhouse Six London whilst satisfying the design whims and extravagent fancies of a selection of bloggers. 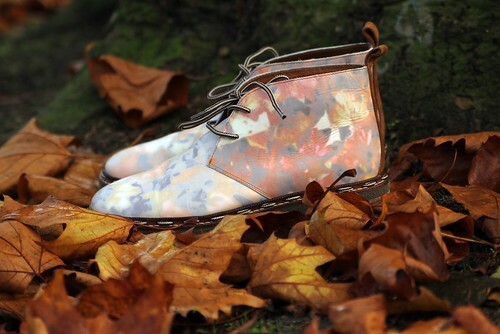 Along with Susie, The Man Repeller, Stockholm Streetstyle, The Cherry Blossom Girl and Facehunter, I've been able to create my dream pair of shoes - the Autumn Leaves Kicking boot. To think that this design idea has been pinballing around my brain for years has now been realised is nothing short of remarkable. 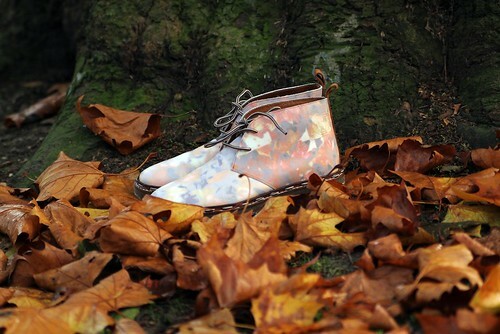 Thanks to the talented team at Six London I've been able to create a true harvest festival of footwear in a limited run of just twenty pairs. Over the weekend, on a perfect misty autumnal morning, I squeezed my feet in to the sample and celebrated the imminent launch by kicking leaves in the park. As previously mentioned, the inspiration for my design centred around my love of the timing of its launch. Now is the time when the rich colours of autumn really come into play and I strive to envelop myself in nature's most magnificent palette as much as possible. These Autumn hues of plum, rich red, deep green and various shades of brown should all be celebrated. 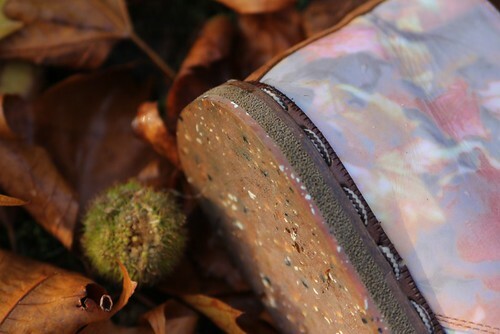 Even the sound of walking through crisp leaves excites me and I wanted to create a shoe that replicated this feeling even walking on the greyest of pavements. 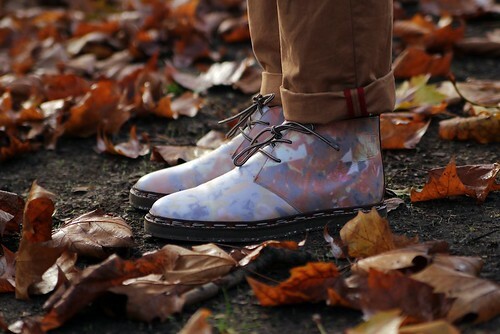 As I walked through the park, surrounded by leaves and little else (the odd dog walker aside), my love for the season was only heightened by the boots. 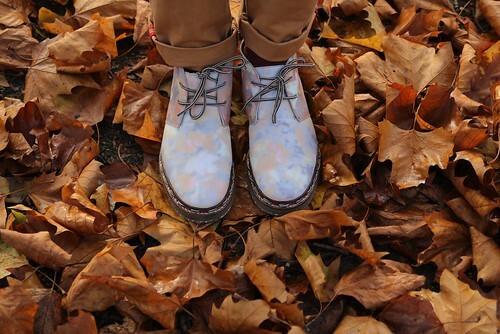 Kicking leaves in the boots for the very first time. 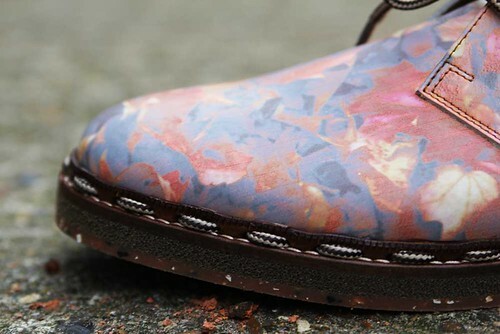 It is a strange feeling wearing a pair of shoes that you have had some hand in designing. Something I really did not think I would ever do. These boots really are my dream shoes (for this season atleast) and I'm so happy with how they've turned out. 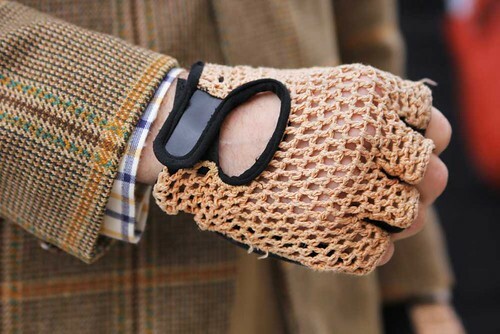 This strange feeling will only be heightened if I ever see people wearing them out and about. 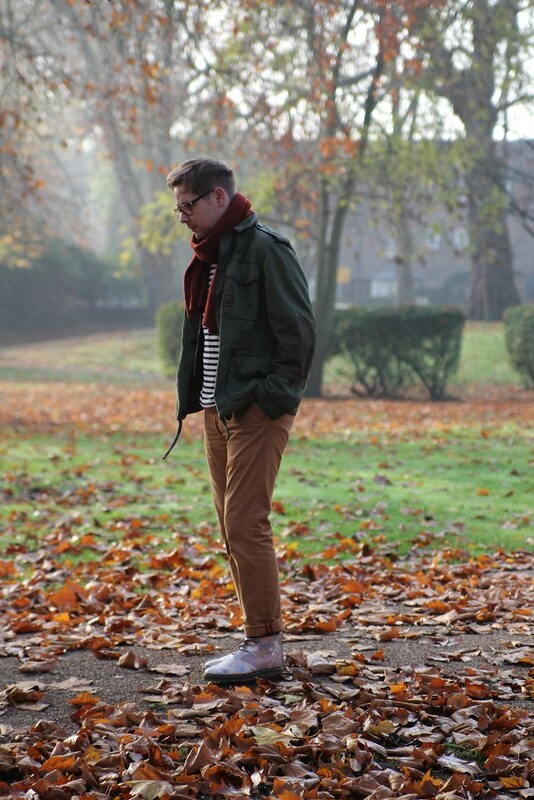 Thankfully, I've been eased in to this week by a blog post from the lovely Anastasia and Duck. It'll be interesting to see them out of the blogosphere though. Currently only available to those who signed up to receive more information about the launch, the sixbysixbloggers will be on general sale tomorrow. Happy leaf kicking! Throughout this blog's lifetime I have periodically bemoaned the lack of truly exciting stores in the capital. I have even defiantly declared that I can count the number of well stocked stores on one hand but there have been a number of additions that have forced me to impugn my previous statement. Over the course of the last twelve months alone I've welcomed Hostem, 3939, LN-CC, Trunk and Anthem to name but another handfull. However, as great as these newcomers are and as much as they should be lauded, I've neglected one or two that have been right under my nose. 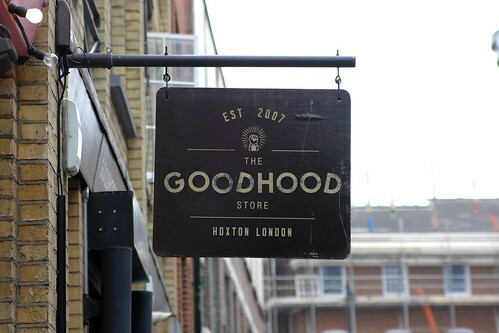 Hoxton's very own Goodhood is one of them. 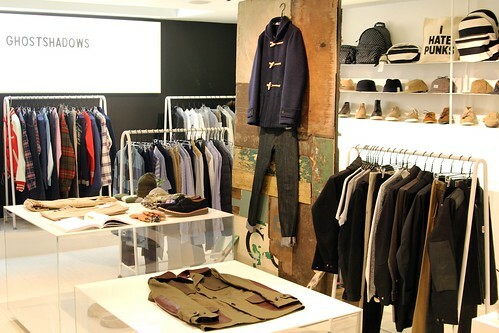 Designers and partners Kyle Stweart and Jo Sindle unveiled this backstreet boutique back in 2007 and the backstreet boutique has since evolved in to one of London's finest stores. 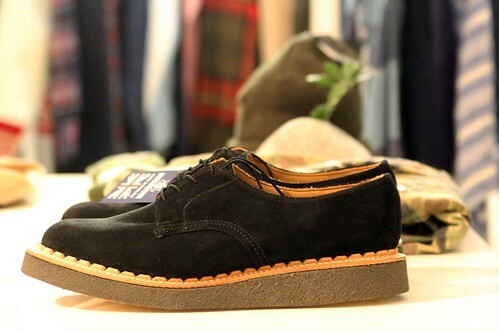 Timeout recently declared it to be the seventh best store in London and their AW11 look book, Beneath the Canvas, left many a blogger breathless whilst its collaboration with R. Newbold is enough to make a grown man soil himself in excitment. Now housed over two floors, the contemporary concept space showcases an international cocktail of independent and rare brands. A considered edit of old favourites and new discoveries it never fails to excite and inspire. 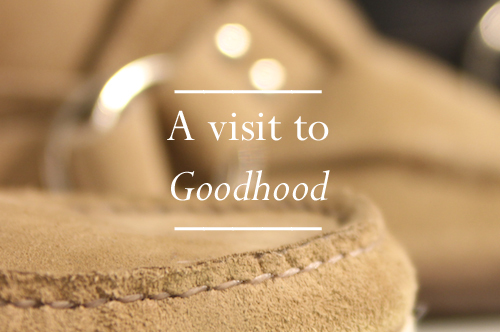 The shared vision for Goodhood is one based firmly on handpicked quality from across the globe. Last weekend I arranged an early morning store visit and was welcomed by Kyle. 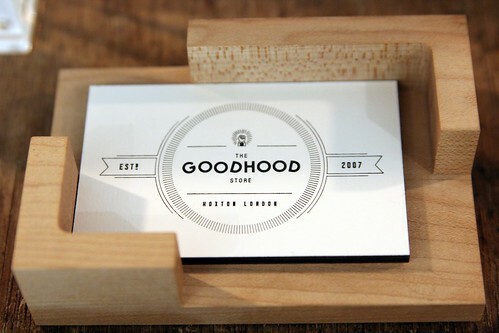 Battling the fatigue of recent fatherhood, the passionate owner was proud to discuss his other offspring, the blossoming Goodhood. It was an absolute pleasure to be talked through the store's offering by the man himself. 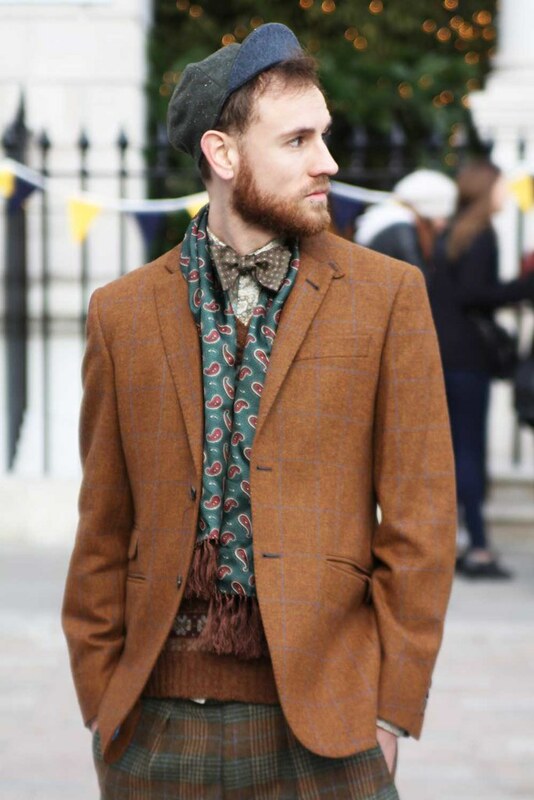 "The addition of the menswear floor has been really important for our development," Kyle declares whilst admiring the increasingly busy area before him. Like everything good in this world, the store could not be rushed and the menswear space naturally evolved through the considered addition of brands and demands of the ever growing customer base. "Evolution as opposed to revolution, I think I remember seeing that on an Arsenal plaque a few years back but it works for us too" and as a Gooner myself, how could I argue with that? 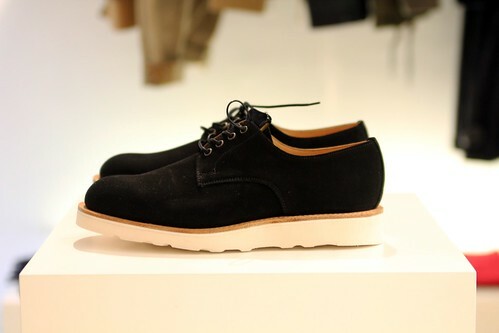 "It is important for us to stick to our style and to add in to it naturally. There are moments when there is a great deal of hype around certain things at certain times and we just try to ignore it. We're never going to buy in to something just because it is hyped. We always try and judge everything on a quality level, is it value for money and qualitative." Once asked how he'd describe the style of the store, he quickly responds with, "in my head, I describe our style as indie, it can be high end or low end, it is just a feeling and everything is mixed in together." Where so many retail spaces have distinct areas, Goodhood opts to create looks that effortlessly blend labels. With a salivation inducing brand list that includes the likes of Junya Watanabe Man, Carharrt Heritage, Paul Smith, Tender and Monitaly to name but a few, it is an eclectic mix but everything sits effortlessly next to one another. That said, it is anything but one dimensional. It echoes any artfully compiled wardrobe. A little of this, a dash of that, all at various price points whilst making perfect sense together. 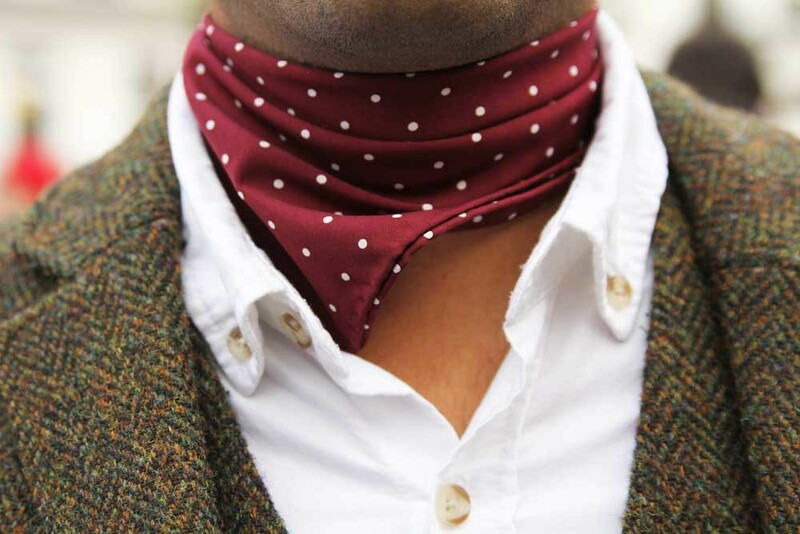 "We're drawn to the style of the East End. it has a certain look. Some people wrongly reduce it to skinny jeans, or have in their mind an idea of Frankie Cocosa but that's not true. For us it is the most stylish area in London. We're watching everybody and are now part of the community, servicing them." As soon as you walk down the stairs you are confronted with temptation. 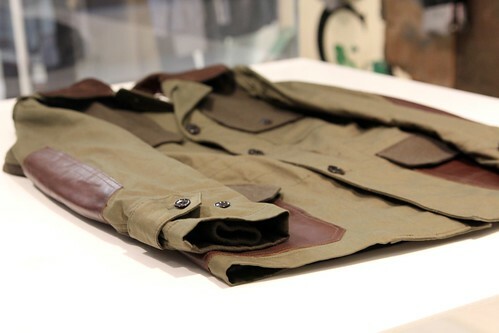 Oh how I would have loved to have picked up the Mackintosh and Junya Watanabe rain coat. Even with a twenty per cent sale on all outerwear, the jacket is still out of reach.. So much to covet in such a tight space. I was instantly drawn to this Junya Watanabe Man parka. "His are pieces that you are going to keep for the rest of your life. I've got Junya jackets that are over five years old and I still love wearing them. 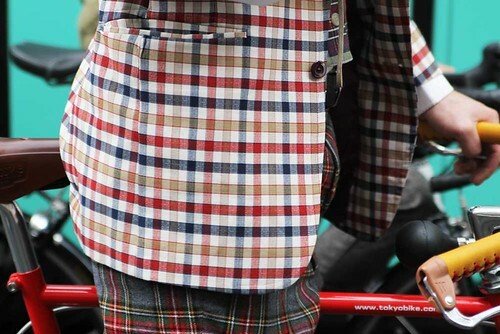 There is always that level of detail and quality of components that combine to create a truly special garment. 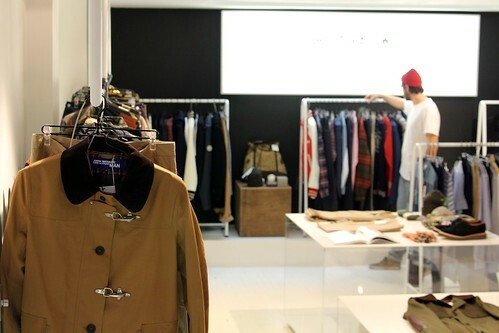 We're always excited to get Junya in and people respond to it really well. It is a label, that even young guys see as an investment." "Unrivaled is another label that always excites us." Another label picked up from Japan, Unrivaled was born out of the original "Let it Ride," label that was founded by Kiichiro-San. 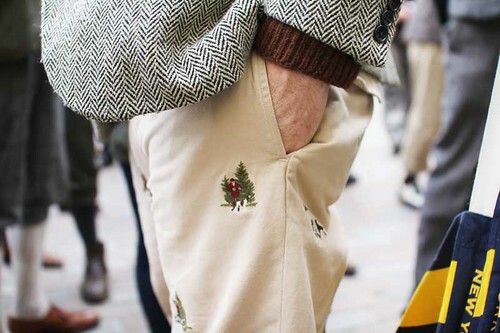 "There is always something special about their clothes whether it be in style or details." 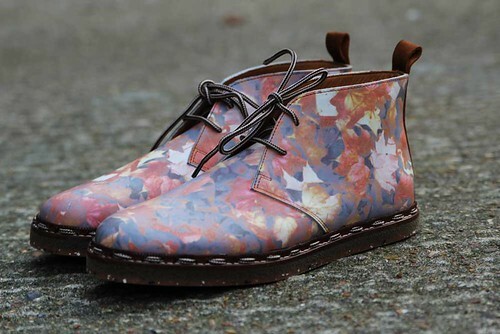 You all know how much I love the British Remains' First Creepers. Specifically designed for Goodhood these fur lined Quoddy's continue their tradition of creating the ultimate in comfort and quality. A wall of streetwear tempation. 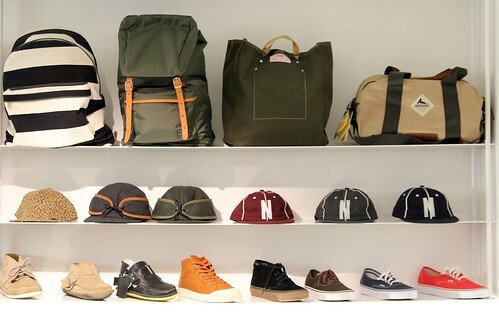 Head Porter Plus, Norse Projects, Pigalle, Spring Courts and Vans. Exclusive to the Goodhood Store this collaboration derby work shoe fuses a classic McNairy design with the Goodhood touch and stamp of approval. PAM's take on the classic chino. Wish I had picked them up sooner because they no longer have my size. 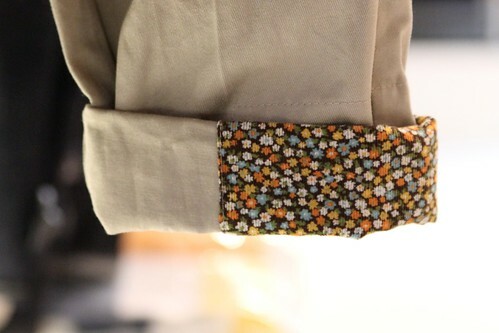 Nice detailing with the use of floral corduroy, subtly seen on the back welt pocket, button loops and the outer part of the turn up hem. I took advantage of the store's excellent array of difficult to source publications and zines. Somewhat spoilt for choice I turned to Kyle for his recommendations. I left with the debut issue of LAW and the second issue of the The Travel Almanac but was tempted by so much more. Whilst there has been much fanfare about the retail revolution of the East (of London), this backstreet boutique has quietly gone about its business and evolved in to one of the finest independent stores in the capital. "Every season it is getting deeper, we are buying in to more lines quite simply because we can. When you open a store it can be a long term struggle getting the brands to sell to you, there's a lot of politics involved. It is a work in progress and we're constantly working on it. It's certainly much easier now to persuade people to come on board and I'd like to continue to add the labels we've had our eye on." I, for one, cannot wait to see which labels join the already bulging brand list. Looking further ahead, Kyle Stewart revealed something that quickened the pulse even more; "we've got plans, we've got the gallery space across the road which has just re-opened. I'd actually love to open more shops on this street and am even dreaming of a hotel right on the corner. You see it in Japan, where stores take over a street and I think it works really well." Here's to the evolution (not revolution) of Goodhood and Coronet Street. The evolution is nigh. Here's to the evolution (not revolution) of Goodhood and Coronet Street.